This page is intended to collect information about playing card databases and playing card collections having structures or content that allow to consider them as databases. Each resource pointed on this page can have different emphasis but relates to playing card collecting. 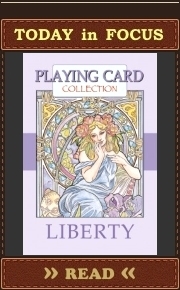 PlayingCardCollector.net subjectively selects links for this page and isn’t responsible for any content of the databases (collections). This is the biggest database of playing cards from around the World managed by Alexander Sukhorukov. The database will provide a playing card collector with minimal information about a deck of playing cards but, as a rule, with all pictures of its cards. The database is regularly updated. Every collector of playing cards can contribute. The World of Playing Cards is an incrementally updated website about the history and visual art of playing cards curated by Simon Wintle (also the curator of The English Playing Card Society website). The website founded in 1996. On-line description and list of Bicycle brand playing cards, a digital copy of Mrs. Robinson’s Playing Card Collector’s Handbook (published in 1955 by Ruth Robinson) and information about dating a deck of United States Playing Card Company playing cards. This site is dedicated to playing cards and playing card collecting. There are also special sections about jokers and playing card ephemera. It was founded in 1998 by Miriam van Houten and Joop Muller (a.k.a. jopo). The main purpose of this site is to show the visitors a large variety of decks from their collection, often related to certain topics, and pass on their passion for these small printed pieces of card to other people too. By sharing their knowledge about playing cards, they hope that more people will be interested in sharing this hobby in the future. This site is managed by the playing card collector, Peter Endebrock. If you are interested in taxes and tax stamps on playing cards, you can find there a compilation of stamps, information and information sources sorted by country. The idea is to help in identifying and dating playing cards. Also Peter Endebrock shows some packs from his playing card collection, and he gives a short description of the cards. As a rule, Peter adds one new deck per month. 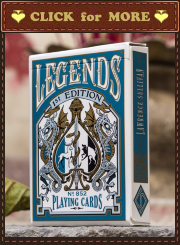 This site is managed by the collector of playing cards, Paul Bostock. 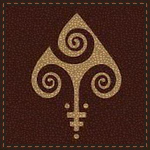 The site celebrates a cultural design icon, the standard English playing card. It is intended as a resource for anyone interested in the English pattern of playing cards, as well as to celebrate the variety of examples that have survived this long. The examples in the gallery of the site illustrate the variety and history of standard English playing cards. Paul Bostock has been a collector of playing-cards since he was a teenager in the 1970s. Paul decided to focus on two areas and chose the history of the standard English playing card and cards of the Worshipful Company of Makers of Playing Cards – the City of London Livery company that has historically represented the English makers.